i really looooove this home featured in apartment therapy. all of the white with pops of color is just my thing, and i love his furniture and restraint used in the decor. i think all the lamps keep things cozy when you are dealing so much white and modernity. fun pillows! i could never get away with this many pillows on the couch (silly boys, not understanding the need for decorative pillows), but aren't they all so much fun? i also love the fabric the sofa is upholstered in. the homeowner says that he bought all of his furniture off of craigslist, and most of his items are from places like target, CB2 and marshalls. a man after my own heart! 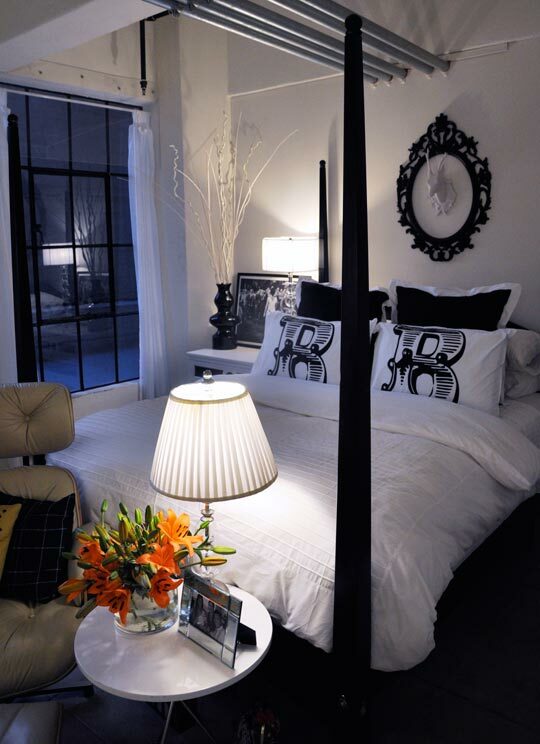 i also love everything about his bed, and the little sitting area at the end of the bed. if i were the homeowner, i'd probably sit and look at this arrangement with a glass of wine and pat myself on the back. Oh wow, this space is TO DIE FOR!! Love, love, love it! Ooh this is fabulous! Cool collection of Sofa Couch.